From the beep of a text alert to the whir of a laptop fan, soundscapes play a major role in students’ experiences inside and outside the classroom. Steph Ceraso, an assistant professor of English, is working to ensure her students think critically about 21st century technologies and the sounds that we interact with every day. Ceraso’s research explores the intersections between digital media production, rhetoric and composition, and sound studies. As part of a course on “Sound, Composition, and Culture” that she taught last fall, she designed a multisensory dining event to inspire students to think holistically about how sound works with other senses to shape experiences. “If we want students to become critical consumers and producers of the kinds of audio stories and sonic experiences that fill our lives, they need both technical training and training in how to think about the distinct possibilities of sound as a compositional and rhetorical medium,” Ceraso explains. The dining event was sponsored by the Maryland Institute for Technology in the Humanities (MITH) and Design, Cultures, and Creativity (DCC) program at the University of Maryland, College Park. 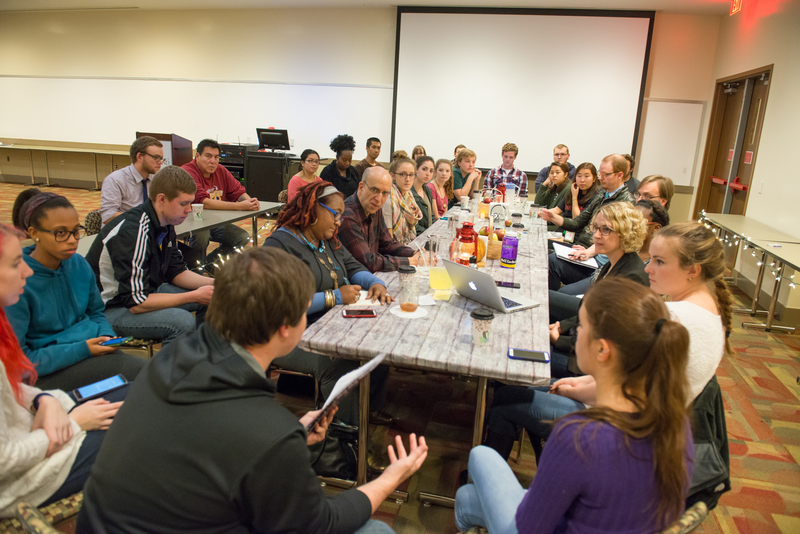 After a semester of learning about sound design and planning the multisensory dining experience, students in the UMBC course hosted a meal for DCC students that paired foods with sounds. These sensory combinations enabled the students to explore how sound, color, texture, smell, and other sensory details affect eating experiences. Ceraso presented the project on a national stage at the 2016 Modern Language Association (MLA) Convention in Austin, Texas last month. Sonic research is growing substantially in the social sciences and humanities, and her research was well received by fellow scholars in the field. “There is a real need for pedagogical approaches to sound and listening across the disciplines, so a lot of scholars from different backgrounds were interested and wanted to know how to do similar projects with their students,” Ceraso says. 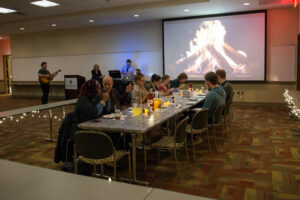 While the multisensory dining experience was a first for Ceraso, she’s confident that students walked away from the event better prepared to analyze the sound that is ubiquitous in an increasingly digital age. Images: Steph Ceraso and students at the sonic meal event. Photo by Marlayna Demond ’11 for UMBC.